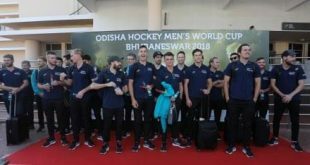 Bhubaneswar: As Odisha gears up to host Odisha Hockey Men’s World Cup 2018 starting 28 November, an FIH (International Hockey Federation) delegation on Monday reviewed the preparations of the prestigious event which will witness 16 top teams in the world vie for the top spot. Accompanied by officials from the host federation Hockey India, Gabrielle van Zwieten, Events Director (FIH), had extensive meetings with Sports secretary Vishal Dev and representatives from various departments of Government of Odisha, to discuss the overall progress of work. The day-long proceedings also included the 5th Executive Committee Meeting for organisation of the Odisha Hockey Men’s World Cup Bhubaneswar 2018 chaired by chief secretary Aditya Prasad Padhi. On Tuesday, Gabrielle will also be visiting the remaining facilities to complete her inspection visit, to check the preparedness to host the International teams. 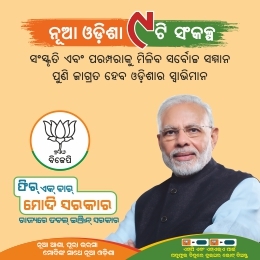 “I am delighted with the progress of work here at the Kalinga Stadium and I am quite confident the venue will be ready well within the stipulated time. 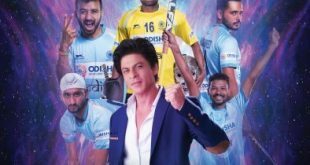 The keenness of the Odisha Govt and Hockey India to deliver to perfection and leave no stone unturned in their preparations to host the biggest hockey event is worth a mention and I am confident the hockey fraternity will witness a spectacular event starting this November,” stated Gabrielle van Zwieten, Events Director, FIH. The infrastructural work at the iconic Kalinga Stadium includes the up-gradation of seating capacity to 15,000. The Stadium will also get two brand new pitches. The floodlights at both main pitch and the practice pitch too have been upgraded while the entire main stadium is being given a face-lift with wider roads, new gates, permanent CCTV cameras for safety point of view. 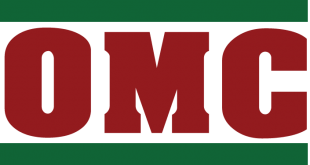 “Bhubaneswar is one of the best venues for hockey in the country today. It is not just the passion the people of Odisha have for the sport that makes us want to bring big international events here but it’s also the pro-activeness of the Odisha Govt in terms of providing world-class facilities to ensure visiting teams, officials, spectators from across the globe get the best experience. 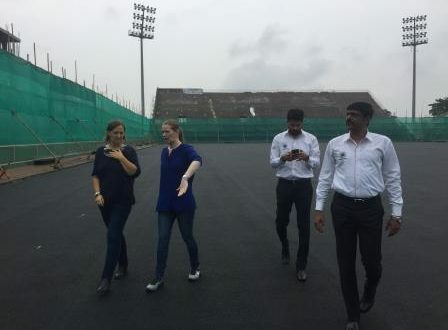 From Hockey India, we have made regular visits to Bhubaneswar and I am happy to note that the infrastructural work is on schedule,” stated Elena Norman, CEO, Hockey India. Vishal Dev said, “We are all quite happy and satisfied with the ongoing preparations for the Odisha Hockey Men’s World Cup Bhubaneswar 2018. In terms of infrastructure, apart from the new turf being laid at the hockey ground, we have upgraded the floodlights of both the practice and main pitch. A total of 36 matches will be played during the Odisha Hockey Men’s World Cup Bhubaneswar 2018. The opening match of the tournament will see World No. 3 Belgium take on World No. 11 Canada on 28th November 2018 while host nation India will also open their campaign on the same day as they face South Africa. The hosts will also be in action on 2nd December 2018 as they play a strong Belgium team whom they defeated in the Quarter-finals of the Odisha Men’s Hockey World League Final Bhubaneswar 2017 at the same venue. India’s third and final Pool match will be against Canada on 8th December 2018. The sixteen participating teams will play three matches each during the league stage over the span of twelve days before four cross-over matches take place on 10th and 11th December 2018. The knockout matches will take place on 12th, 13th, 15th and 16th as the teams will look to become the Champions of the prestigious quadrennial event which was won by Australia in 2014.